The global market for clinical trial management system is estimated to grow owing to the rising investments in research and development of clinical trials from 2017-2025. The competitive landscape of this market is immense with the limited presence of key players accounting for a huge market share. Some of the key players are continuously making efforts in their business so as to enhance consumer base and expand product portfolio. Furthermore, these leaders are focusing on mergers & acquisitions and partnerships to capture more market share and continue to maintain their position in the coming years as well. Few of the key players existing in the global market for clinical trial management systems include DSG, Inc., DATATRAK Int., IBM Corp., Microsoft, Apple Inc., Cinven, Veeva Systems, Forte Research Systems, Inc., MedNet Solutions, Inc., and Wipro Limited. 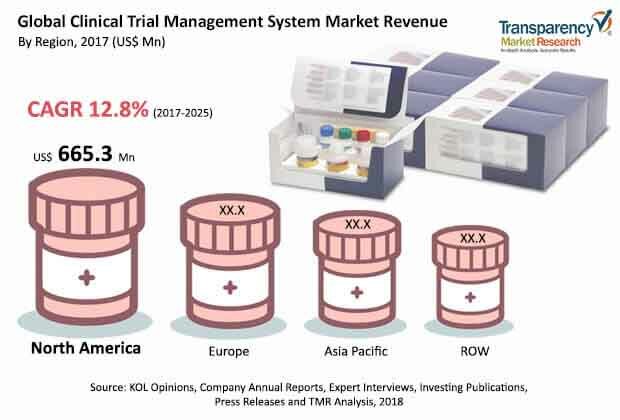 The clinical trial management systems market was valued at US$1.1 billion in the year 2016 and is anticipated to reach US$3.2 billion by the end of 2025. The global market for clinical trial management systems is estimated to exhibit a robust CAGR of 13% during the forecast period. According to mode of delivery, the cloud-based segment is expected to witness the highest expansion within the forecast period. Owing to the high spending and rising demand on cloud-based technology, this segment is likely to boost the demand of global clinical trial management systems market. Software was the leading segment in terms of component in the year 2016. This segment is anticipated to lead the global market throughout the forecast period. The enterprise-based segment as per type is likely to expand at a significant rate in the forecast period. According to end-user, the pharmaceuticals sector is forecasted to expand rapidly and offer huge growth opportunities in the upcoming years. With the growing adoption for cloud-based technology and rising number of research institutions in countries such as China, Japan, and South Korea, Asia-Pacific region is predicted to exhibit a strong and positive growth rate throughput the forecast period. The global clinical trial management systems market is primarily driven by rapid improvements in research & development activities and increasing investments by government organizations. In addition to this, rising investments by biotechnology and pharmaceutical companies are also boosting the demand for clinical trial management systems market. Another key factor supporting the growth of this market is the rising prevalence of chronic disorders that will surge the demand for efficient and effective data management and documentation within medical institutions. The adoption of clinical trial management systems is expected to increase in the coming years with the increasing number of healthcare end-users and service providers. The major driver responsible for augmenting the growth of this market is the accurate information offered while using the clinical trial management systems. Also, the rising awareness among various consumers especially in developed countries regarding the advantages of using this management system is estimated to surge the demand in the forecast period. However, the growth of clinical trial management systems is likely to hamper in the coming years owing to the lack of awareness amongst people with respect to the use and availability of this management system. This is majorly seen in emerging countries. Another factor restricting the growth of this market is the presence of strict rules and guidelines to register patients for these clinical trials. Also, time consumed for the approval of clinical trials is too long, which in turn hinders the development of clinical trial management systems market.